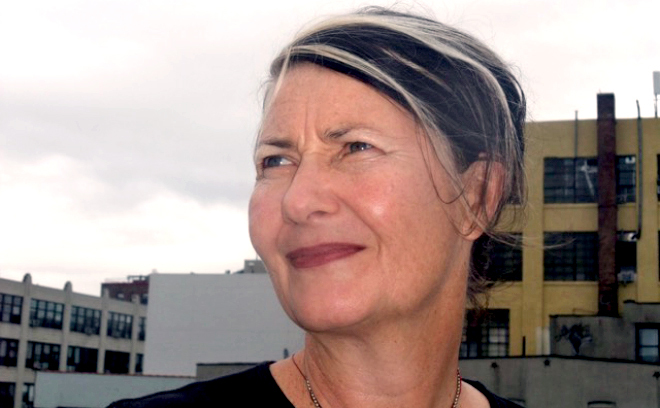 Marlene McCarty is a visual artist, activist, and title designer. In film, she has worked with directors Todd Haynes, Kelly Reichardt, Cindy Sherman, and Phyllis Nagy, among others. McCarty grew up in Lexington, Kentucky, and attended the University of Cincinnati as well as the Allgemeine Kunstgewerbeschule Basel in Switzerland, studying graphic design and film animation. Since the 1980s, she has worked across various media, from film and motion design to print and advertising to guerilla installations and exhibitions. She was a member of the AIDS activist collective Gran Fury as well as co-founder of design studio Bureau, which she founded with Donald Moffett. In 1990 Gran Fury participated in the 1990 Venice Biennale Aperto, and recently their work was on view at the MCA Chicago and the Walker Art Museum. McCarty’s work has been seen in exhibitions at 80WSE, the New Museum, the Brooklyn Museum, the Bronx Museum, ICA London, as well as a drawing retrospective at the Royal Hibernian Academy in Dublin. Her work has also been included in collections at MoMA in New York, MoCA in Los Angeles, Queen’s Museum, and the Cooper Hewitt. She has been the recipient of a Guggenheim fellowship, a Pollack-Krasner Grant, the Richard Diebenkorn Fellowship, and, as Gran Fury, an honorary Doctorate from Massachusetts College of Art (2011). She is represented by Sikkema Jenkins and Co.
As a designer, she has worked with studios including MoMA, M&Co., and Bureau, and companies including Sundance Channel, Calvin Klein, HBO, Amazon and more. She has designed title sequences for TV including mini-series Mildred Pierce and documentary series Independent Lens. In film her title design credits include Swoon (1992), I Shot Andy Warhol (1996), American Psycho (2000), The Safety of Objects (2001), Hedwig and the Angry Inch (2001), Meek’s Cutoff (2010), and Night Moves (2013). For director Todd Haynes she has designed title sequences for the films Safe, Velvet Goldmine, Far From Heaven, I’m Not There, and Carol. McCarty is an Associate Professor at NYU Steinhardt. She is based in New York City.